Regions in which barbarians are commonly found include the Chondalwood (ghostwise halflings, and wild elves), Chult, the Hordelands, the Moonshaes, Narfell, the Nelanther Isles, the North, Rashemen, Vaasa, and the Western Heartlands. In addition, some shield dwarven, wild elven, wood elven, and half-orc cultures give rise to barbarians. Bards are common in many lands, including Amn, Chessenta, Cormyr, the Dalelands, the Dragon Coast, Evermeet, Luiren, Impiltur, the Moonshaes, Silverymoon, Tethyr, Thesk, Unther, the Vast, Waterdeep, and the Western Heartlands. Gold dwarven, moon elven, sun elven, lightfoot halfling, and strongheart halfling bards are also common. Lands where druids hold sway include Aglarond, the Chondalwood, Chult, the Great Dale, the High Forest, the Moonshaes, the North, the Vast, the Vilhon Reach, and the Western Heartlands. Moon elves, sun elves, wild elves, wood elves, ghostwise halflings, and lightfoot halflings commonly produce adventuring druids, too. Every part of Faerûn produces capable warriors, but the lands of Aglarond, Amn, Anauroch, Calimshan, Chessenta, Cormyr, the Dalelands, Damara, the Dragon Coast, Evermeet, Luiren, the Hordelands, Impiltur, the Lake of Steam, Lantan, the Moonsea, the Moonshaes, Murhorand, Narfell, Nelanther Isles, the North, Rashemen, Sembia, the Shaar, Tashalar, Tethyr, Thay, Unther, the Vast, the Vilhon Reach, Waterdeep, and the Western Heartlands are renowned for their fighters. In addition, gray dwarves, gold dwarves, shield dwarves, drow, moon elves, deep gnomes, rock gnomes, lightfoot halflings, and strongheart halflings encourage the fighter class. Monks are most common in Amn, Calimshan, Damara, Mulhorand, the Lake of Steam, and Silverymoon. Strongheart halflings are also culturally inclined toward becoming monks. Paladins often come from Cormyr, the Dalelands, Damara, Luiren, Impiltur, Mulhorand, Silverymoon, Tethyr, and Waterdeep. Rogues are of two general stripes - thieves and brigands. Thieves are common near any large city, and brigands (sometimes charitably referred to as scouts) live in the wild. Rogues are common in Amn, Anauroch, Calimshan, the Dragon Coast, Evermeet, Luiren, Impiltur, the Lake of Steam, Lantan, the Moonsea, the Moonshaes, Mulhorand, Narfell, the Nelanther Isles, Sembia, the Shaar, Tashalar, Thesk, Unther, Vaasa, the Vast, Waterdeep, and the Western Heartlands. Gray dwarves, gold dwarves, shield dwarves, drow, moon elves, sun elves, deep gnomes, rock gnomes, lightfoot halflings, and strongheart halflings are commonly rogues, too. Rangers are found on the fringes of civilization in places such as Aglarond, the Chondalwood, Chult, the Dalelands, Damara, Evermeet, the Great Dale, Luiren, the High Forest, the Hordelands, Lake of Steam, Narfell, the North, Rashemen, the Shaar, Silverymoon, Tashalar, Vaasa, Vilhon Reach, and the Western Heartlands. Moon elves, wild elves, wood elves, deep gnomes, lightfoot halflings, strongheart halflings, and half-orcs are often rangers, too. Sorcerers are found in Aglarond, Calimshan, the Dragon Coast, the Great Dale, the High Forest, the Lake of Steam, Mulhorand, the Nelanther Isles, the Shaar, Silverymoon, Tethyr, and the Western Heartlands. Gold dwarves, wild elves, and lightfoot halflings display a knack for the sorcerer's arts, too. 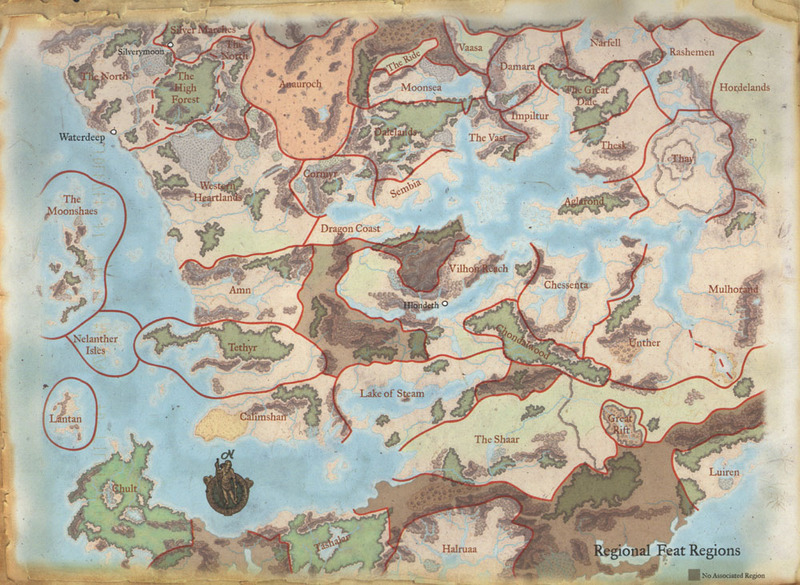 Lands where wizards are relatively common include Calimshan, Chessenta, Cormyr, Damara, Evermeet, Halruaa, the Lake of Steam, Mulhorand, Rashemen, Sembia, Silverymoon, Tethyr, Thay, Unther, Waterdeep, and the Western Heartlands. Races with similar traditions include drow, moon elves, sun elves, wood elves, and deep and rock gnomes, who frequently specialize as illusionists.